There are many benefits in having a multiple entry long validity Schengen visa. The first and foremost is that you can plan and leave whenever you fancy a visit to the Continent without having to worry about how to obtain a Schengen Visa appointment and then wondering how long it will take to get a Schengen Visa. A traveller who can show evidence of frequent travel to a Schengen country can quite easily obtain a multiple entry Schengen visa however there are a number of other factors which might affect the length of the visa granted. By understanding how some of the below mentioned documents have a major influence on the validity of the visa you can ensure that you have a better chance of obtaining a Multiple Entry Long Validity Schengen Visa. Schengen Visas for tourism purposes are always granted as a Short Term Schengen Visa. These Schengen Visas can be valid for a Single Entry or for Multiple Entries. This is dependent on the documents submitted and is granted at the discretion of the embassy of the country where the application is made. IMPORTANT: Please note that even after obtaining a multiple-entry long validity Schengen Visa you are not entitled to visit any Schengen Country for more than 90 days in any six month period. Also please be aware that you will not get a Schengen Visa valid for more than 6 months if you are applying for a Schengen Visa for the first time unless you are the spouse or family member of an EU national. Showing evidence of previous travel to Schengen countries is quite useful in obtaining a multiple entry long valid Schengen visa. By showing that you have previously travelled to many Schengen States and conformed to the rules of visa, you increase your chances of being granted a long term visa. 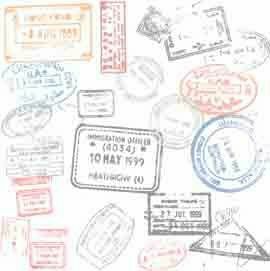 Showing evidence of travel and holding previous or current visas to the USA, Canada or Australia may also help. When a Schengen visa has been obtained for the first time, it is critical that you keep to the travel plans submitted with your Schengen Visa application. This shows the Embassy that your travel plans were genuine and that you were not using their embassy just to get a quick Schengen visa. By using one Schengen country's embassy to get a visa and travelling to another Schengen country will considerably decrease your chances of getting another Schengen Visa in the future. You can also try to increase the validity of the visa by showing evidence of future travel planned to the same country. For example, by showing evidence of travelling toItalyin August 2011 and then again in December 2011, you increase your chances of getting a Multiple Entry Schengen Visa valid for 6 months. Schengen Visas are granted only up to three months before the expiry of the passport. So ensure that your passport has a longer validity. If your passport is expiring within one year then it is recommended to renew your passport before applying for a Schengen Visa. Showing some empty pages in the passport for entry/exit stamps may also help. If you are residing in a country other than your country of citizenship (Example Indian national residing in UK on a Residence Permit like a work visa or student visa) then your visa status and validity plays a very important role in deciding the length of the Schengen visa. Schengen Visas are granted only up to three months before the expiry of your residence permit. So ensure that you apply well in advance before your current residence visa expires or renew your residence visa and apply afterwards. Ideally, you should ensure that your current visa is valid for at least six months. If you decide to apply with less than 90 days of your residence visa validity then your Schengen visa will not be granted. The chances of getting a long term Schengen visa increase if your residence permit is valid for more than at least one year. Higher the validity of your residence permit higher are the chances of getting a long term Schengen Visa. The type of residence visa you're on in a country also plays a key role. Being on a Work Permit gives you a better chance at a long term visa than being on a student visa. Being on an Indefinite Visa (Permanent Residency) gives you an excellent chance of obtaining a Schengen Visa valid for at least 3 years. Even better, if you are married to an EU National then the chances are quite high of being granted a multiple entry Schengen Visa valid for 5 years. Being employed on a permanent basis for a long time or showing employment contract valid for a long period helps in getting a long Schengen Visa. If you are a student then showing that the course lasts for a long duration (example: for over 2 years) may ensure a long Schengen Visa. Being unemployed and not showing any proof of income may reduce the chances of even getting a visa. Travel Insurance should include Medical Insurance and Emergency Repatriation to a value of at least Euros 30,000. The length of the Travel Insurance plays an important role in determining the length of the Schengen Visa. Having a Travel Insurance valid for multiple trips for at least one year will greatly increase your chances of getting a one year multiple entry Schengen Visa. Not all Schengen Embassies grant long term multiple entry Schengen Visas for tourism purposes. Scandinavian countries like Norway, Sweden, Denmark and Finland are very notorious for granting visas only for the requested period if not a little more.Spain and Greece are also miserly in granting multiple entry long term Schengen visas for tourism purposes.France is one country which is quite consistent in granting multiple entry Schengen visas even for first time applicants. Please note that the issue of a Schengen Visa or the validity of the Schengen Visa is entirely at the discretion of the embassy of the country where the application is made. The notes above are only a representation of factors that might affect the length of the Schengen Visa. Even satisfying all the above factors might not be able to get you a long term Schengen visa as it is dependent on the country which is granting the Schengen visa and is also dependent, to a certain extent, on the nationality of the applicant. www.visasforindians.com provides a comprehensive list of documents that are required to apply for a Schengen Visa. It also provides a list of visa not required countries for Indians and visa on arrival countries along with the requirements for the countries to which a visa is needed by Indians.